Sometimes allure is in a name. When I read books on how to create literacy centers and run guided reading groups my first year of teaching, I liked a lot of what I read. But I wanted to find a “hook” to get my kinders into their activities and get them to read and write! 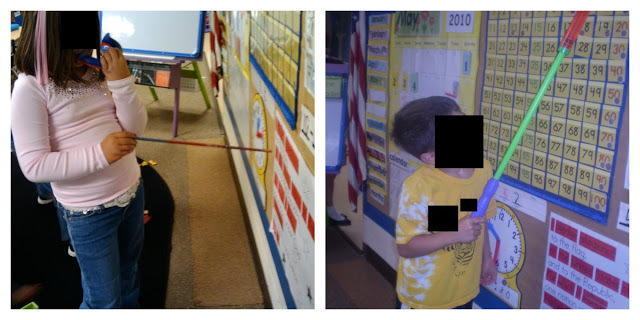 Like I shared in my puppet center, the puppet is the hook I use to get my kinders engrossed in reading leveled texts independently. One of the centers I read about but wanted to give my own twist was a “read the room” or “write the room” literacy center. I felt as if I could easily combine these and give them fun feeling materials to help keep them going all year long. 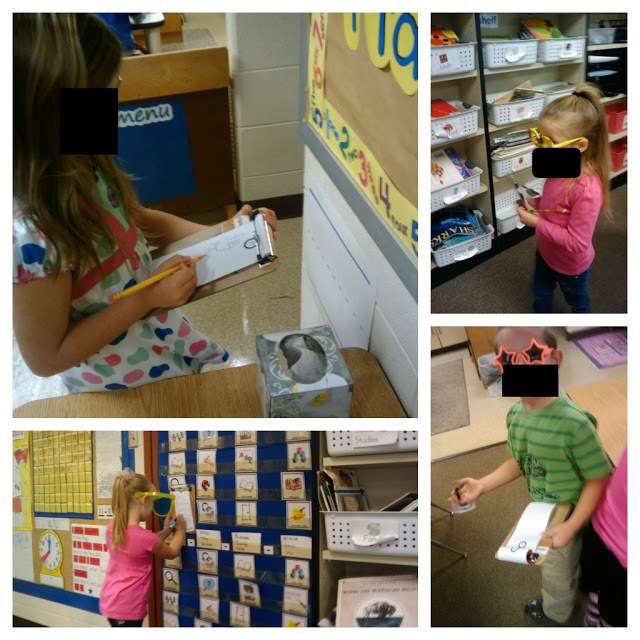 My kinders can have choice in deciding which activity they’d like to do and they are instantly letter and word detectives. As I said, allure is in a name… hence our detective center. 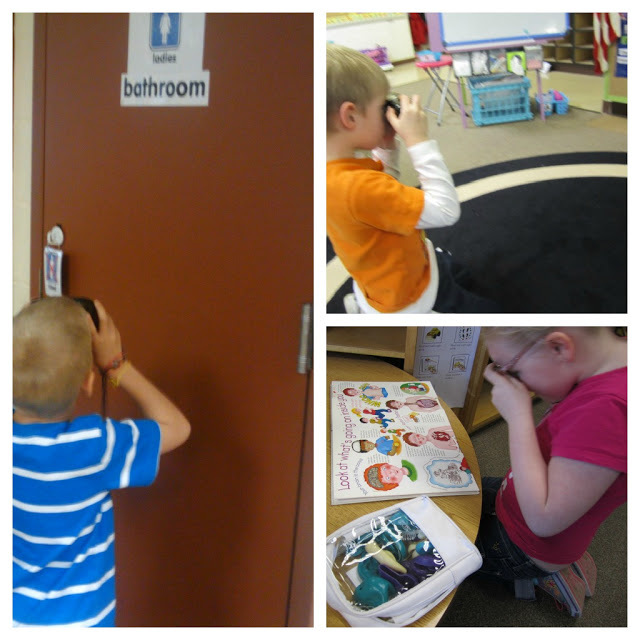 They can read the room using a phonics phone and a pointer. We have lots of pointers to offer choice and some of our favorites are the Dollar Tree water blasters (minus the h2o) because they can reach our charts up high. 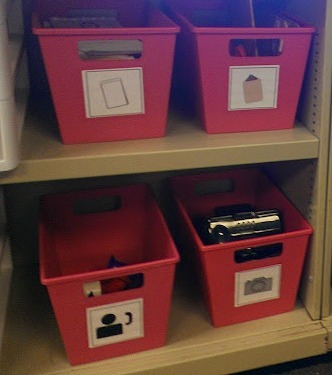 This read and write center is organized simply with buckets holding all of our materials. Open top plastic containers are used everywhere in my room to contain the madness! These were a score from the Dollar Tree and always seem to show up in the spring. I snag a new, fresh set to replace any broken ones since they don’t hold up so great after a lot of wear and tear. But… the handles, the size (and admittingly – the colors) make the replenishment worth it! The other favorite activities are using cheap-o cameras (minus the film or batteries) to take photos of focus letters, sounds or words around the room. And this one they grow into but it quickly becomes the preferred activity. 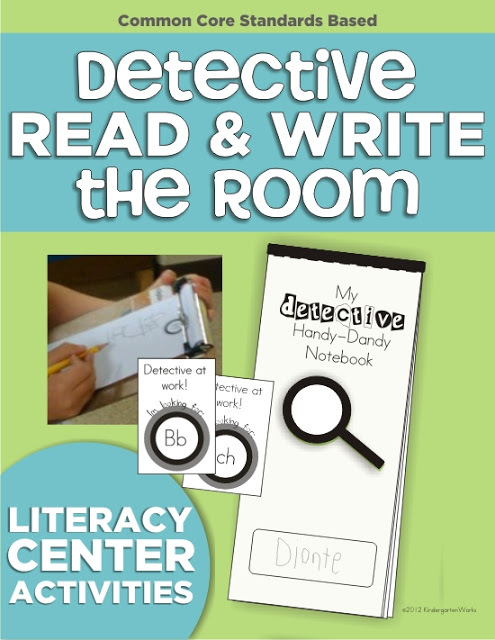 Students can sneak effortlessly around the room using their mini-clipboards and handy dandy detective notebooks to write the room. I love the first moment when they can read the words they write and its not just about finding focus sounds! Did I mention the sunglasses? What detective wouldn’t need such a tool to go unnoticed? My kinders like this small touch of whimsy and we have instant allure! K.RF.1.c-1. Isolate words within printed text. K.RF.1.c-2. Point to individual words using one-to-one correspondence. K.RF.1.c. Understand that words are separated by spaces in print. K.RF.1.d-3. Identify orally all uppercase letters in random order. K.RF.1.d-4. Identify orally all lowercase letters in random order. K.RL.4.e-2. Break words into sounds to read unknown words. K.L.1.a-3. Print all uppercase letters. K.L.1.a-4. Print all lowercase letters. K.L.1.f-2. Write by moving left to right and from top to bottom. This detective center has allure and lasts all year long! How do you give your literacy centers a bit of flair? If you like what I do here on KindergartenWorks, then be sure to subscribe today. I look forward to sharing ideas with you weekly. puzzles – have on hand? I love the camera idea! Does each child have their own detective book to write the words? And if so, how do you store them? Just curious. Thanks! Yep! Every child has their own detective notebook to write in. I simply store them in those pink buckets as pictured above. There is one that has a picture of the notepads on the front, and that’s where we store the class set. Thanks for asking! Love it! I’ll be adding the glasses to my own “detective” center—thanks again! How fabulous! I love the idea of the sunglasses! Gives it that next level of excitment!! Thanks Staci! The dollar tree has great options! I love the idea of the cameras and sunglasses! When I get back into the classroom I would like to try this! I may have the kids make their own binoculars out of 2 cardboard toilet paper rolls stapled together – punch holes at the top and add yarn long enough to be worn around their neck. I found this idea online somewhere when I was planning out a rainforest unit. The kids had a ball decorating them and loved using them as well!